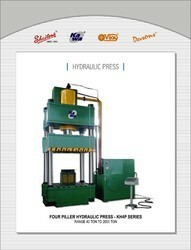 Offering you a complete choice of products which include four pillar hydraulic press and four piiar hydraulic press. The Kawa product this series applies to the press techniques of various Metal, sheet metal as well as plastic materials, such as punching, Forming, bending, straightening and crimping etc. it can also be used for application like pushing mounting, forming of grinding wheel, press forming of plastic, rubber and powder Molding and compacting products.